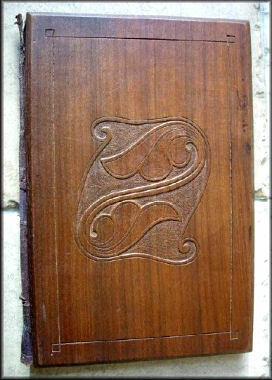 Very few wooden items carved by Alexander Ritchie exist. Almost all of them were made during his very first years of permanent residence on Iona, and these items date roughly between 1898 and 1903. 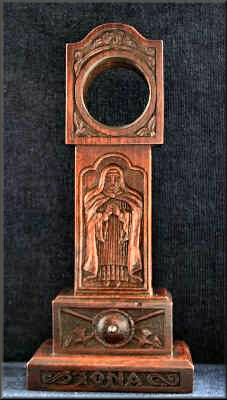 The few known examples include picture frames, Celtic crosses, and miniature clock or pocket watch holders. Shown here is a wonderful example of Ritchie's woodcarving skills. This is a pocket watch holder in the form of a miniature grandfather clock. The size is height 31 cm, width 13 cm, depth 8 cm. Looking from the front, the centre panel depicts a finely detailed carving of Prioress Anna (see the 'Ancient Carved Stones' section of this site). 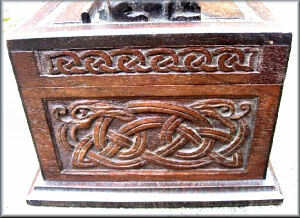 On either side, the centre panels have detailed carvings of St Martin's Cross and MacLean's Cross respectively, between panels of ornate knotwork beasts. 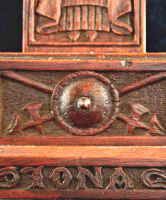 On the front at the base is the word 'IONA', carved in stylised lettering. 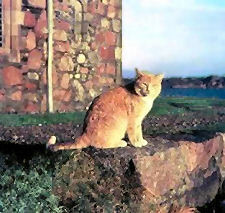 The base has a date of 1900 and Alexander Ritchie's initials carved into it. Possibly a unique piece, as the two other similar-shaped pocket watch holders I have seen by him have different carvings on them. 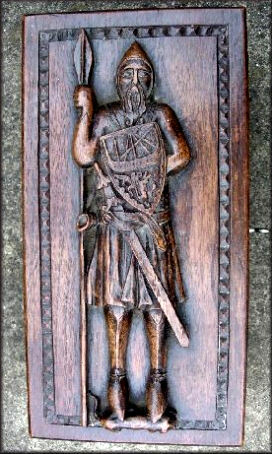 Scarce wooden letter opener with Celtic cross handle, and fine carving on the blade of a medieval chieftain, taken from an early Iona grave slab. Early piece c.1905. 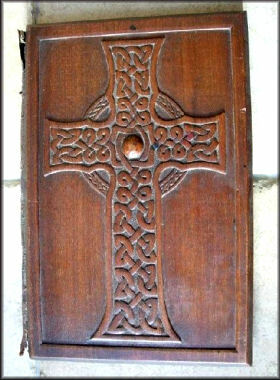 Unsigned Alexander Ritchie Iona school wooden hinged writing-blotter, fine celtic cross on the top, and Iona foliate ornamentation taken from stone carvings on the island, on the underside. 1900-1905 period. Size 32 x 20cms. 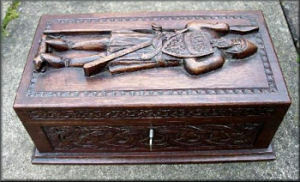 Here is a very fine piece of Alexander Ritchie's earliest woodcarving. Superb detail of Celtic knotwork ending in easts' heads, surrounding a medieval Chieftain, the design taken from one of the existing 13th century carved stones of Iona. The base of the box is signed AR and dated 1901. The box has a lock and key. Overall size is 28 x 15 x 10cms. An exquisite and exceptionally rare item.